As its name implies, a power amplifier is a type of amplifier that supplies power to one or more speakers but does not have the additional features you will find on a home theater receiver, such as radio reception, input switching, and audio/video processing. The only control you may find on a power amplifier (besides an on/off switch), would be a master gain control (gain is analogous to volume). To get the audio signals to a power amplifier, a separate preamp or AV preamp/processor is needed. The AV preamp/Processor is where you connect your source components (Blu-ray, DVD, CD, etc...). The AV preamp/processor decodes or processes incoming audio source signals and passes them, in analog form via line outputs using familiar RCA-type connections or, in some higher-end preamp/power amplifier combinations, XLR connections to the power amp, which, in turn, sends them out to the speakers. Power amplifiers come in several types of channel configurations, from one channel (referred to as a monoblock) to two (stereo) channels, or, for surround applications, 5, 7, or more channels. When 9 channels are needed, a user might employ both 7 and 2 channel power amplifiers and in the case where 11 channels are needed, a 7 channel amplifier is teamed with two 2-channel amplifiers. In fact, there are some that use a monoblock amplifier for each channel - Now that is a lot of amplifiers! For home theater applications, in addition to providing power to your speakers, you also have to take the subwoofer into account. If the subwoofer is self-powered (the most common type), then it has its own internal amp. 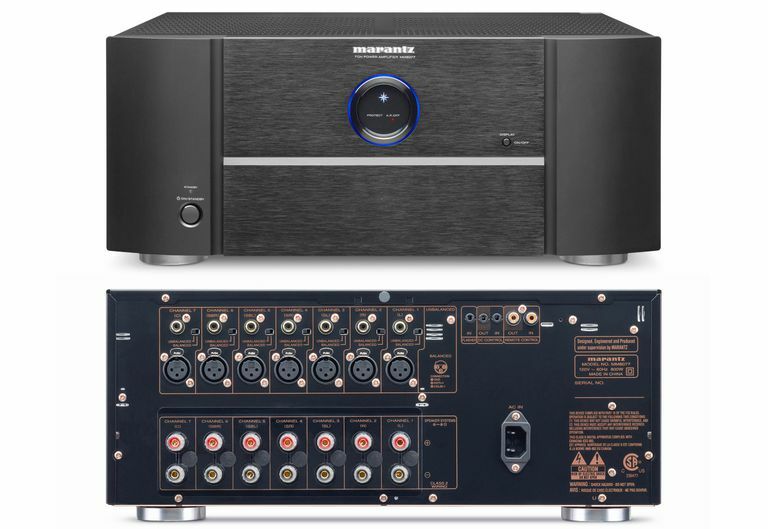 To get sound to a powered subwoofer, you just need to connect a provided subwoofer preamp output from an AV preamp/processor or a home theater receiver. However, if the subwoofer is a passive type, a subwoofer preamp output needed to be connected to an external power amplifier (referred to as a subwoofer amplifier). This type of amplifier is only used to power the subwoofer and should not be used to power the rest of the speakers. Although home theater receivers provide their own built-in amplifiers that can power speakers, there are some receivers that also provide a set of preamp outputs that can be connected to one, or more power amps to provide a greater power output than its own built-in amplifiers may have, effectively turning the receiver into an AV preamp/processor. However, it must be noted that in this type of setup, the receiver's own internal amplifiers are bypassed. What this means is that you cannot use the built-in amplifiers of a home theater receiver and external amplifiers to power the same channels at the same time. Also, if a home theater receiver has Multi-Zone capability, then the Zone 2 (or 3,4) preamp outputs can be connected to an external power amps(s) for powering a set of speakers that may be placed in a different location, while still retaining used of the receiver's own built-in amplifiers for use in the main zone. For example, if the receiver is a 7.1 channel receiver and has preamp outputs available to run a two channel independent zone - then you can operate the main 7.1 channel zone, and the 2-channel second zone at the same time, taking advantage of additional power amps connected to speakers in the additional zone. An integrated amplifier differs from a power amplifier as it features source input connectivity and switching, as well as varying degrees of audio decoding or processing, in addition to a built-in amplifier for powering speakers. However, unlike a stereo or home theater receiver, an integrated amplifier does not have the ability to receive AM/FM radio transmissions, and, only in rare cases, can stream music from the internet - in those cases it would be marketed as a "streaming amplifier". Also, integrated amplifiers typically only provide for a two-channel speaker configuration. In most home theater setups, a home theater receiver is used to provide all the connectivity and switching needed for source components, such as Blu-ray/DVD/CD players, Cable/Satellite Boxes, external media streamers, and a VCR (if you still have one), as well as providing all needed audio processing (and sometimes video processing), as well as providing power to your speakers. That is definitely a lot for a single device to handle, and for some, separating the input switching and audio/video processing from the actual task of providing power for, and connection of, loudspeakers by separate AV preamp/processors and power amplifiers are preferred by some users. Since amplifiers generate a lot of heat, there is an added benefit of housing the amplifier circuitry and power supply in a separate device, rather than cramming it in the same cabinet as all the other receiver-type functions, especially in rooms where lots of amplifier output power is required, or desired. Another reason that using a separate preamp and power amp might be desirable is that even though it creates more equipment and cable clutter, they provide more setup flexibility as the power amps don't go out of date as quickly as a preamp might - especially with continuing changes in source connectivity and audio/video processing features. If you have an older home theater receiver, its built-in amps may be perfectly fine, but if it no longer meets current audio/video connectivity and processing standards - you end up tossing out perfectly good amps, just to get all those newer features.